Transit Supportive Densities – What Do They Look Like? Recently, GreaterGreaterWashington blogged about density, using Google maps 3D images to show what different densities look like in Washington, DC. Visuals like these are so important because most people hear “density”, think “Manhattan” and can’t say “no” quickly enough. 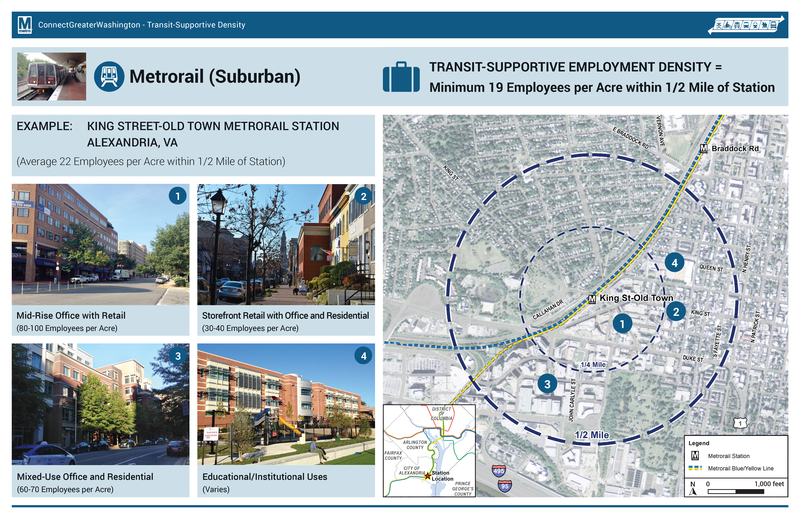 Last fall, we completed work as part of ConnectGreaterWashington and the Transit Corridor Expansion Guidelines that illustrated the differences in desired employment and/or residential densities within a transit walkshed by each mode. As is typical for planning projects, especially when expanding transit service along new corridors, density is discussed and jobs and/or households per acre targets are tossed around. But most people (full disclosure, that includes me) do not know what 4 households per acre or 150 jobs per acre looks like. 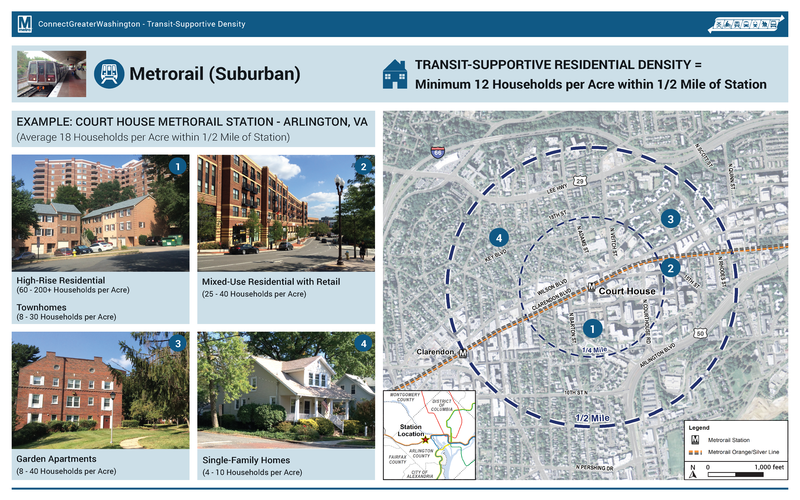 It is especially important because a residential target of 12 households per acre within a half-mile of a suburban Metrorail station, for example, does not mean that every residential dwelling needs to meet that target. Instead, within the half-mile radius, the overall density should be 12 or more households per acre. That gives plenty of room to have less dense single family homes (on small lots) and more dense high rise apartments with studios and one-bedrooms. 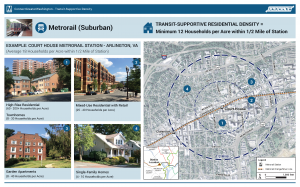 Below are example stations for each mode and the employment and/or residential density targets, along with images of the different building types that combine to meet or exceed the targets. We’d appreciate your feedback on whether they make sense to you and if they would resonate with the general public. 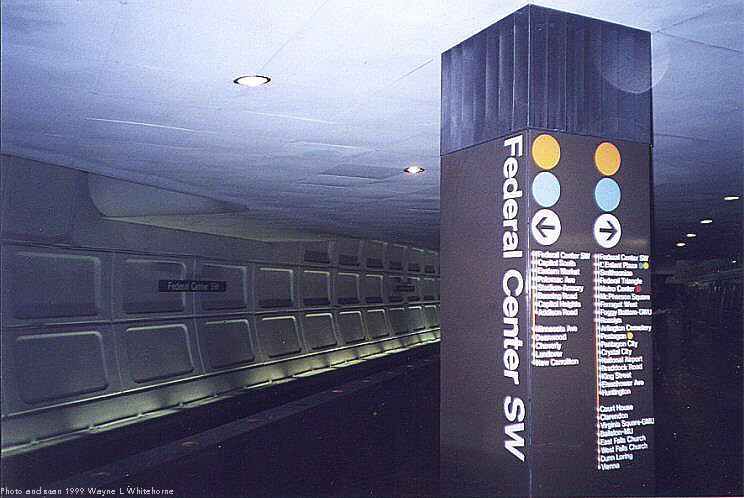 Note, because of the variability in density across the Metrorail system, we created two types of Metrorail stations to estimate densities. Agenda released for upcoming event focused on identifying rider needs in the apps & maps space. Expect name tags and group activities at our upcoming event. 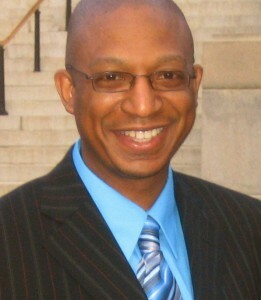 Photo credit Open Data Nation. Two weeks ago we announced we were hosting an event here at Metro on October 15th to engage the developer, rider and advocate communities to uncover unmet needs and potential solutions to them. 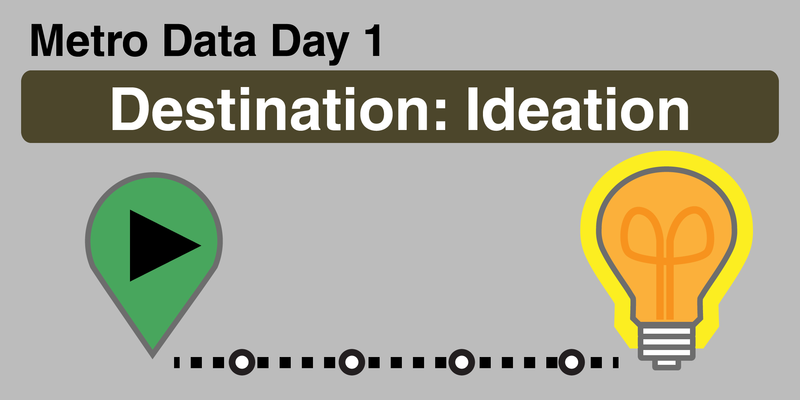 We plan to have some fun and meet new people, and we are calling it Destination Ideation. For those who are interested but haven’t signed up yet, please go to the event page to claim your free ticket. We need a good estimate of the head-count to manage the event. We are looking forward to seeing you on October 15! Metro added an additional seven price points to SelectPass starting in August, and customers have started to take notice! 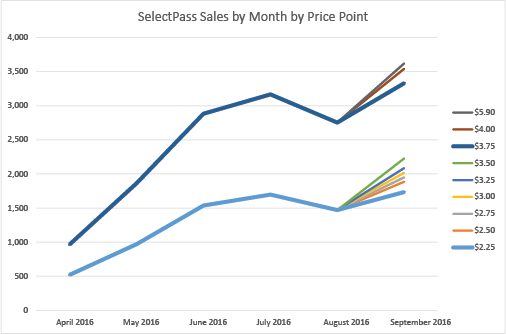 SelectPass sales by month in a stacked line graph, meaning total sales is the value of the upper-most line. Perhaps you recall Metro is testing a new, custom-value pass. Customers “select” their usual commute trip and then can purchase a monthly pass priced at 18 days of commute travel. Since all months have more than 18 work days, this new pass offers regular customers a great deal. The pass began with two price points ($2.25 and $3.75) and included rail-only and rail-bus options. As you may have heard, Metro expanded the SelectPass pilot to 7 new price points on August 22, for September passes. And customers have responded. As you can see in the graphic above, the base-fare pass sales for September exceeded their sales levels for July. And instead of eating into sales of the base-fare pass, the new price points are adding additional pass sales. Transit and bikes go hand in hand. 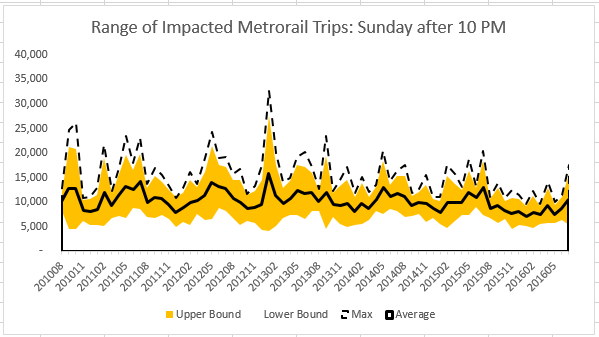 Not only can riders bike to and from stations for that first and last mile, but biking is a great way to get around when Metrorail is under maintenance. It’s important that our policy makers understand the importance of having good bike infrastructure. On Sunday, September 18th, I rode around DC with a bunch of planners from across the country in town for the American Planning Association’s (APA) annual Policy and Advocacy Conference. This annual conference gears planners up to advocate for federal, state and local policies that advance good planning principles through the legislative process. There are two days of training workshops and speaker sessions and an entire day of meetings on Capitol Hill, where planners meet with their representatives to discuss planning issues and their importance to creating strong communities. Planning to Walk, Bike, Telework or Take Metro on September 22? Then take the pledge to go Car Free. Car Free Day is this Thursday, September 22. Any of us who live or work in the Washington region can pledge to go Car Free or “Car Lite” (meaning some access to a car or van pool) to help raise awareness about alternative modes of travel relative to driving alone. In addition to showing your support for a good cause, you might even win a prize. 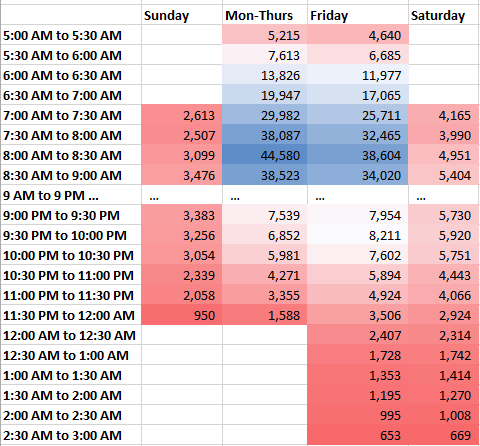 Interest in Car Free Day is widespread, from folks who don’t even own cars (see our post from a few years ago) to folks who typically drive alone to work and may need a little encouragement to try something else. Last year, more than 3,500 people pledged to go car free in the region. About 38% said they would bike, 22% would take rail, and 17% said they would use a bus as their primary mode of transportation. 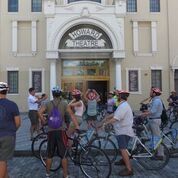 As with Bike to Work Day, events like Car Free Day can have a lasting impact beyond the one-day event by leading people to make changes in the ways they choose to get around. So help bring up this year’s number of pledges by signing up today. 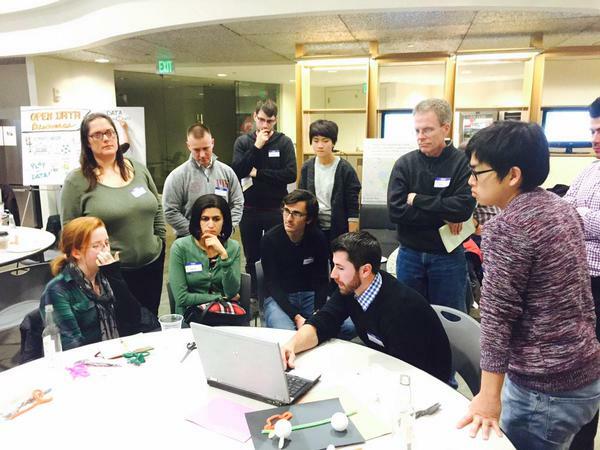 Metro to Continue Dialogue with App Development Community and Riders! 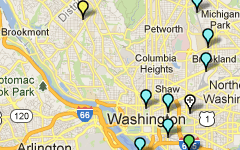 Metro Data Day 1 will bring together Metro staff, the app developer community, riders and advocates. 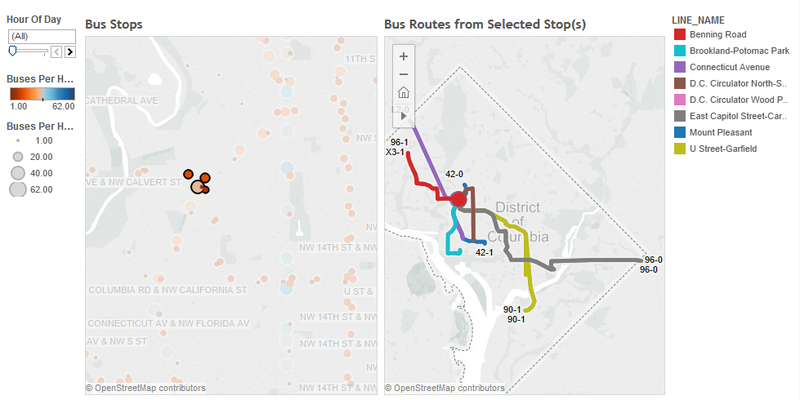 Metro has some great data feeds, and app developers — from Google and Apple to Metro Hero — are consuming them to provide great tools for transit riders in the Washington DC region.